Just opened in 2009, Le Vintage Hostel is ideally located only a few minutes walk from Gare du Nord. This means that once you arrive to Paris you don't have to worry about using the metro or a cab; you can just walk to us in about seven minutes. All of our rooms have free air conditioning and private facilities with showers and toilets so you won't have to run to the end of the hallway to get a shower. All our double and twin rooms have a private balcony with a view of Paris rooftops, flat-screen TV and a safe in each private room. Our hostel is cleaned daily and we have a high standard of security with our secure keycards. We also offer a huge social area with free Wi-Fi and free breakfast. Our friendly and knowledgeable staff are on hand to help you choose from among the many pubs, restaurants, cafs and bistros that are located all around our hostel. Reception is open 24/7 for your safety and to welcome you. We have free linen, free maps, free iron and ironing boards, free use of major mobile phone rechargers and free luggage day storage after check-out. Theres also a lift, English newspapers, a fax and printing service and high-speed internet kiosks, plus on-site laundry facilities and a full-service gym equipped with a steam room. 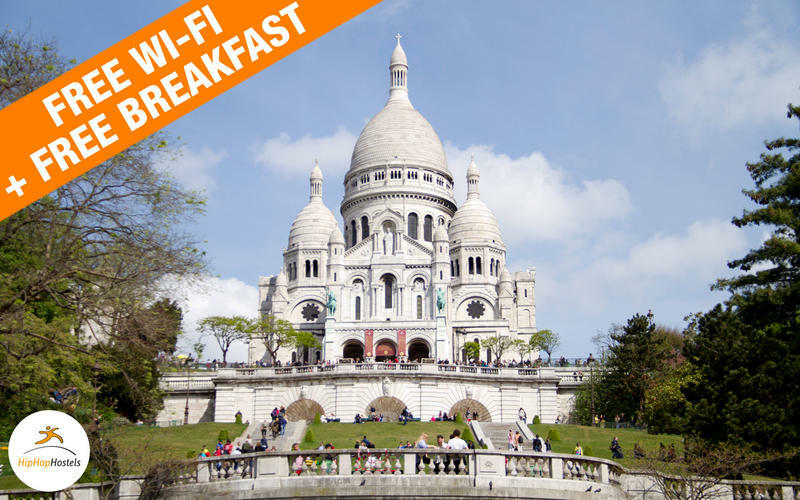 Our hostel is super close to many of Paris's most famous areas and sites including Montmartre, Sacre Coeur, Operathe Moulin Rouge and Pigalle. For visiting the rest of Paris were only steps from the world-class Paris metro that will easily get you to the Champs-Elyses, the Eiffel Tower, Louvre, Notre Dame, Opera and anywhere else in the City of Light. Le Vintage is perfect for travellers looking for a convenient location and who desire the privacy and comfort of a hotel with the entertaining atmosphere of a hostel. Travelling as a couple, group or with your family but still want a fun place that won't murder your budget? Book with us now! In case we are full, we suggest that you try the other Hiphophostels located nearby. These include Le Regent Hostel, Vintage Hostel, Woodstock Hostel, Caulaincourt Hostel and Plug-Inn, all available here on Hostelworld. Other hostels and budget hotels include Oops! and Young & Happy in the Latin Quarter; The 3 Ducks and Aloha over near the Eiffel Tower and Absolute Hotel which is located on Canal St. Martin. Each of us in the Hiphophostels family (code for we all have the same owners). All Hiphophostels are consistent in that we have friendly and knowledgeable staff, we are all located in convenient and authentic areas of Paris and offer great value for the money. We are not cookie-cutter in that we are all the same. Like any family we all have our own personalities but we are sure a Hiphophostel has something for every type of budget traveller. Cheers everybody for checking out what Le Vintage Hostel has to offer. We hope that that you book with us and we have the chance to welcome you to Paris. Dont forget to bring some humour and a smile! Please note that guests under the age of 18 must be accompanied by an adult and are not permitted in the dorms; they can only stay in a private room with the adult. Exit the station Rue Dunkerque. Take a right and follow Rue Dunkerque for about 7 minutes and voil, here you are. Yes, it's THAT easy. Take RER B direct to Gare du Nord (30mn). Exit the station Rue Dunkerque. Take a right and follow Rue Dunkerque for about 7 minutes and voil, here you are. Take the OrlyVal (its a train) to the RER B direction Paris, exit at Gare du Nord and follow Gare du Nord directions as above. Take line 2 and exit at Anvers. Head to Rue Dunkerque and we will be down on the right after a couple hundred meters. Take the Bus to Porte Maillot (bus terminal). From here go to Metro Line 1 and get on in the direction of 'Chateau de Vincennes'. Change at Charles de Gaulle Etoile to Line 2 in the direction of Nation. Exit at Anvers station and follow direction from Anvers as above.